Alabama police killed this Black man, now DA Danny Carr must charge them. Emantic Bradford Jr. was only 21 years old with a whole future ahead of him. But now he is gone, all because the police executed him. It all happened right on the evening of Thanksgiving Day when an active shooter was at a shopping mall in Hoover, Alabama. There was chaos everywhere. But it all turned tragic when an off-duty Hoover Police officer, working as a security guard at the mall, shot and killed Emantic. Emantic's family says he has a license to carry a firearm and went inside the mall to only protect people. The case is already becoming a mess, with the Jefferson County District Attorney Mike Anderton just being removed from office. And the police keep changing their story and telling more lies. The Hoover Police Department has yet to release the name of the officer who killed Emantic, and the officer remains on paid administrative leave. At first, he was praised for stopping the "gunman." Then the next day in a statement, the police department said based on evidence, Emantic Bradford Jr. was not the shooter and the actual shooter remains at large. Then police backtracked once again and said Emantic "brandished a gun." But now the Hoover Police Department issued another statement saying Emantic "simply had a gun in his hand." There is video footage from the officer's body camera that is now in the hands of the Alabama Law Enforcement Agency (ALEA) and it is unclear if it will be released to the public. 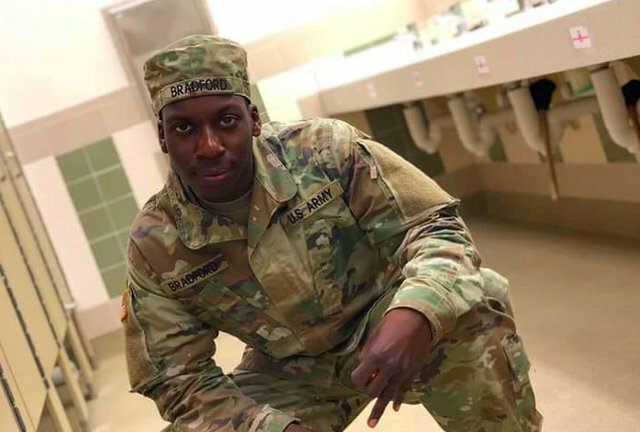 The police killing of Emantic Bradford Jr. is just another heartbreaking reminder that Black people are constant targets and threats in this country -- even when making the sacrifice to protect others. Just two weeks ago in Illinois, Jemel Roberson, a Black man who worked as a security guard and a permit to carry a firearm at a bar, stopped a restrained a person who was firing a gun, only for police to arrive and shoot and kill Jemel instead. Enough is enough. Families are left to mourn and search for answers, while officers continue to stay on the job and kill people in our communities. Now that Jefferson County District Attorney Mike Anderton has been removed from office, it is up to acting District Attorney Danny Carr to investigate the shooting death of Emantic Bradford Jr and charge the officer. This DA cannot let a killer cop walk free. We demand that you charge and prosecute the officer who killed Emantic Bradford Jr. The young man was only 21-years old. Now the family is seeking and deserve justice. We are concerned about how much the Hoover Police Department is covering up and releasing false and conflicting information about the killing of Emantic Bradford Jr. District Attorneys must stop ignoring the killing of Black people. Police are not above the law. We demand transparency and accountability.